Please call ahead to ensure the services you need are available for your visit. The library offers free proctoring services Monday-Friday so online and distance learners may take their exams. To arrange for a proctor, contact the Adult Reference Desk at 815-895-2500 ext. 126 or email kimh@sycamorelibrary.org. All requests for proctoring services must be received by the Library at least one week in advance. Please contact the library to confirm your appointment before the date of the exam and to ensure all materials have been received. The library offers free notary services to community members. To use this service, please bring your unsigned items and i.d. with you. To ensure that one of our notary staff is available, please call 815-895-2500 ext. 126 before your stop in. If you live in Illinois and need to register or update your voter registration we can help. Simply bring two proofs of identification to any of the service desks and we can help you with the process. NOTE: You must be a U.S. Citizen and 18 years of age or older to register. Patrons, organizations, and local businesses may put a display in the case to show off personal collections or promote an upcoming program or event. The case is 2’ x ’2’ x 4.5” high with three adjustable/removable glass shelves. 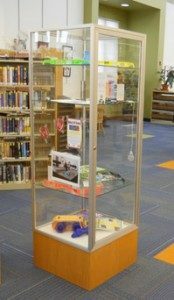 If you have questions about the Display Case, contact our Adult Services Department at 815-895-2500 ext. 126 or email us at refstaff@sycamorelibrary.org. If you are ready to go, fill in the application and staff will get back to you to confirm your date to use the case. We ask that you limit use of the case to one time per year.